We know how much all of the children love Nickelodeon and all of the Nickelodeon characters, and today dear friends you can see that today, we have prepared for you a very special and very interesting new online girl game from the Nickelodeon games category. This new category for kids is going to be called Butterbean's Cafe, and you will see that it's a brand new cartoon made by Nickelodeon, and you will have to be sure that in the shortest time, you will manage to play all of the Butterbean's Cafe games, because you will see that they are going to start appearing once the new category is going to be published. For those that do not know anything about the Butterbean's Cafe category, you can see here on our website, that it's a nice and very fun Nickelodeon story that you will manage to know if you play all of our games, and for that you will have to make sure that in the shortest time, you will manage to meet with all of the characters such as Butterbean, Cricket, Poppy, Dazzle, Jasper and Ms Marmalady. 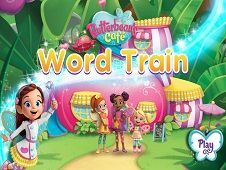 All of these characters are going to be main or secondary characters in the Butterbean Cafe games category from Nickelodeon, and you will see that many interesting fun games are going to be ready for boys and girls, in which you will meet with amazing characters and even magic characters. We said something about a magical cahracter, because dear friends the entire story is going to be set in Puddlebrook, a magic world, where all the Butterbean's Cafe characters can meet, play, finish adventures and live their ordinary lifes. The main character of this new online Nickelodeon story is going to be Butterbean, a young and very cute little fairy that workds in her own cafe or coffe shop as we all know it, where all the citizens of Puddlebrook are coming to meet and greet each other and tell stories about their magical lifes. Cricket, Poppy, Dazzle and Jaspe which we mentioned earlier are also going to be in the Butterbean's Cafe, because they are Butterbean's best friends and loyal helpers. The characters in this new Nickelodeon story are going to be magical most of the time, and that means that they are even talking animals such as chipmunks and rabbits. Nothing is as good as it sounds, so we have a villain in this new Nickelodeon story, and you can see playing all of the Butterbean's Cafe games that it's going to be Ms Marmalady, which is a grumpy lady that tries to put Butterbean's Cafe out of business for her own gain and try to have more money from her shop. This is a very fun and interesting story for kids, because dear friends Ms Marmalady is trying in each episode to close the Butterbean's Cafe using different methods, but she never succedes. You will have the chance to help Butterbean defeat Ms Marmalady, so you have to make sure that you will manage to gain a lot of points in each kids game that we have prepared for you from Nickelodeon, and we are sure that Butterbean is going to have a great time and that she is going to gain a lot of points in each and every one of the games that she has prepared right here on our website, where dear friends you will see how many other boys games and kids challenges from Nickelodeon are going to be ready in the nearest future to continue to appear right here on our website, where we have a lot of free online games and fun games category with your favorite stories ready for you to play. The Butterbean Cafe games category is going to have a lot of education games for kids, such as interesting puzzles with all of the Nickelodeon characters, free memory games that you can play for free, interesting girl games such as dress up and make up challenges that you can see only here on our website, and we are sure that you will have a great time searching and playing the Butterbean Cafe games, and you will see that many adventures with fairies and magic characters are going to appear from Nickelodeon. Have fun! YOU KNOW THIS ABOUT Butterbean Cafe Games? In Butterbean Cafe Games page you can find 1 games that we've published for these kids and children that are interested to play Butterbean Cafe Games, this game category have been created on 08.02.2019. These games with Butterbean Cafe Games have been voted a lot of times and we are inviting you to let a comment after each of this game.